With the new feature, Siri plays catch-up to other assistants and prepares for the release of HomePod. One of those things people expect to be able to do with smart speakers is to get a news briefing in the morning. It was one of Alexa’s first tricks when the Echo launched in 2014, and a core feature of Google Home in 2016. With the HomePod on the way, it simply has to be one of Siri’s powers, too. It’s table stakes. And so it has come to pass. Previously available only to users running the iOS 11.2.5 beta, the new news feature is now available to everyone in the US, UK, and Australia. To invoke the new feature, simply say, “Hey Siri, give me the news.” (Other similar phrases like “what’s in the news” will also work.) Siri will begin playing a news digest podcast from NPR by default. If you use the Home button (Side button on iPhone X) to invoke Siri, asking for the news gives you this, instead. You can switch news sources, if NPR doesn't suit you. 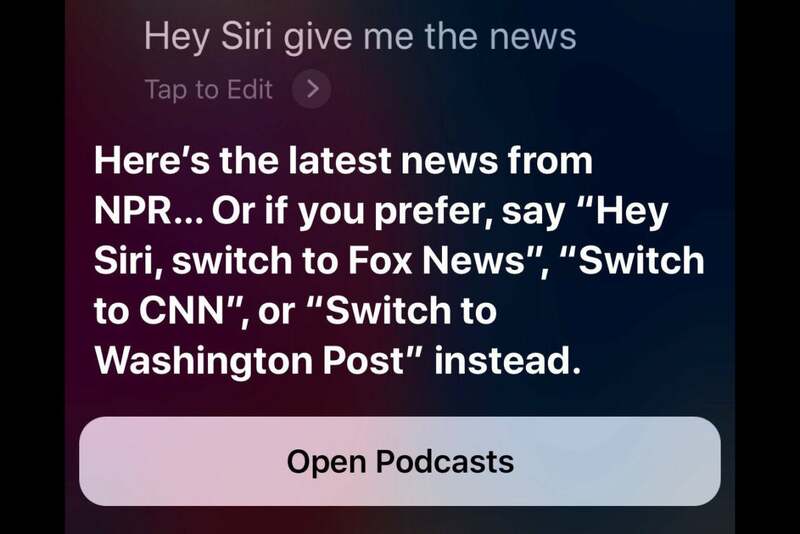 Simply say, "Hey Siri, switch to [Fox News, CNN, Washington Post]" to change sources. In the UK, the audio news digest defaults to the BBC but can be switched to Sky News or LBC. Australians choose from ABC, SBS, or Seven Network. There are a couple small quirks to know about. First, the audio news digest plays back through Apple's own Podcasts app. If you have removed that app, as I had, you may notice your last-used audio source starts playing (an Audible audio book for me) while you're prompted to re-install the Podcasts app. Second, this feature only works if you invoke Siri with the "Hey Siri" voice command. If you hold down the Home button (or Side button on the iPhone X) to wake up Siri and then ask for the news, you'll get a list of news stories from Apple's News app on your screen. This feature is clearly in preparation for Apple's delayed-but-coming-soon HomePod release. Though Apple is pitching HomePod as a music-first device, it will necessarily compete with Amazon and Google's smart speakers and will be expected to have many of the same core functions.